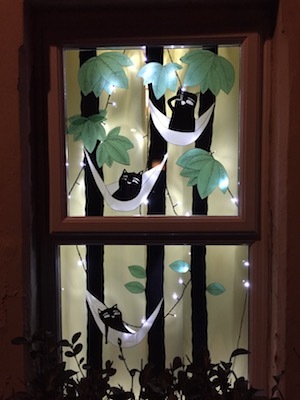 Window Wanderland comes to Brislington on Friday 1st, Saturday 2nd and Sunday 3rd March 2019. Sign up to take part in this community event which will light up windows and give you the chance to see your neighbourhood in a different light – just click on Take Part In This Event at the top of this page. Follow us at @briswindowwanderland on Instagram for window inspiration and workshop information. 2019 is the year the new Brislington Green Trail will be launched, and to celebrate this we’re seeing in the spring by lighting up Brislington with our own green-themed Window Wanderland. From Arnos Vale at one end to Eastwood Farm at the other, the trail is a variety of independent projects all coming together: our aim is to make our area an even nicer place to be for residents and visitors, promote community activities and celebrate our green spaces. Take the green theme and use it as literally or loosely as you like (or anything goes!). We can’t wait to light up Brislington as winter comes to an end! Come and get ideas and inspiration for your window! Plan, draw and even make something to take home to get your window started. Art and craft supplies provided. Donations appreciated – suggested amount £2.